Electronic Hot Sale > Blog > Computers > Sick and Tired of Hillary’s Email? It’s Not Over Yet – The Nation. Sick and Tired of Hillary’s Email? It’s Not Over Yet – The Nation. When Bernie Sanders told Hillary Clinton in their first debate back in October that he was “sick and tired of hearing about your damn e-mails,” he spoke for most of us. Yet she continues to be vulnerable on this issue: While the FBI recently recommended no charges in the matter, FBI Director James Comey took the opportunity to rebuke Clinton for her decision to maintain private e-mail servers, which led to a drop in the polls. That’s why Republicans are doing everything they can to keep her e-mail in the news. And now they have a new front in their campaign: They’re arguing that Clinton violated the Freedom of Information Act (FOIA) by storing official information on her private e-mail servers. Anti-Clinton legal activists have brought a lawsuit in US District Court for the District of Columbia based on a potential FOIA violation, and the FBI’s decision did not resolve that question—so expect to hear lots more about Clinton’s e-mails between now and November. There’s one big problem, however, with the FOIA: It applies only to documents in the files of federal agencies—and that’s why Clinton’s setting up private servers creates a conflict with the freedom-of-information law. Officials long ago figured out that they could avoid disclosing the records of their actions by moving records outside of government-agency control. The most notorious has been Henry Kissinger. Of course, in his day as secretary of state there was no e-mail; instead, there were telephone records. When he left Washington, Kissinger prevented disclosure of his phone records under the FOIA by removing them from the State Department and donating them to the Library of Congress, which is not a “federal agency,” and which agreed that, for a long time to come, those records would be made public only with the consent of the other parties to the calls. The Reporters’ Committee for Freedom of the Press challenged the agreement by filing a FOIA lawsuit for the documents. The Supreme Court eventually ruled that, since the records were no longer at the State Department, it didn’t have to comply; and, since the Library of Congress is officially part of Congress, it didn’t have to comply either, because the FOIA doesn’t cover Congress. Kissinger’s intent in removing documents from the State Department was to keep them secret. When Hillary Clinton set up a private e-mail server at her home, did she have a similar intent? We don’t really know. Initially, she said the private server was for private e-mail—“emails about planning Chelsea’s wedding or my mother’s funeral arrangements.” Thanks to the FBI investigation, we know that was false—30,000 e-mails on those private servers dealt with her work as secretary of state. If this case has a deterrent effect on other officials who might seek to circumvent FOIA, that will be good. Indeed, Congress did not set rules regarding officials’ use of private e-mail accounts until 2014, after the Clinton e-mail scandal broke. Even under the new law, officials are not barred from using private e-mail for official business; instead, it requires that copies of work-related e-mail be forwarded to a .gov account within 20 days. Now the federal courts are hearing an FOIA suit brought by the right-wing legal organization Judicial Watch, which sued the State Department three years ago seeking documents on Hillary Clinton’s employment of Huma Abedin in the State Department at the same time that Abedin was employed by the private Clinton Foundation. (Judicial Watch has been filing FOIA requests for documents about the Clintons every year for more than two decades.) The case took on new life when the existence of Clinton’s private server was revealed and Judicial Watch raised the question of Clinton’s intent in setting it up. Judge Emmet Sullivan of the US District Court for the District of Columbia in May permitted Judicial Watch to depose two of Clinton’s closest aides, Abedin and former chief of staff Cheryl Mills, and said last month that he might require Clinton herself to testify. That would get the e-mail back in the news and disrupt Clinton’s campaign—which is, of course, the goal of Judicial Watch. But even if the courts eventually rule that Clinton had violated the FOIA along with Federal Records Act, the remedy in such cases is simply for the defendant to hand over the documents the plaintiffs have requested—it’s not a criminal proceeding. Even so, the Republicans would make the most of Clinton’s losing a Freedom of Information lawsuit. Nevertheless, the Republicans have found a new way to keep Clinton’s e-mail in the news for the months leading up to the November election—no matter how sick and tired we may be of hearing about it. What the author does not mention is the real damage of the emails. Clinton exercised elite privilege and got away with it. Anyone else handling the level of classified data she did—TS/SAP–would have been out of a job. The FBI probably would not have been so considerate and benign in their interpretation of the law. Her lawyers completely wiped the server so nothing could be recovered. But not obstruction of justice. They removed the email program from one server so that the emails crumbled and could not be read. But not obstruction of justice. 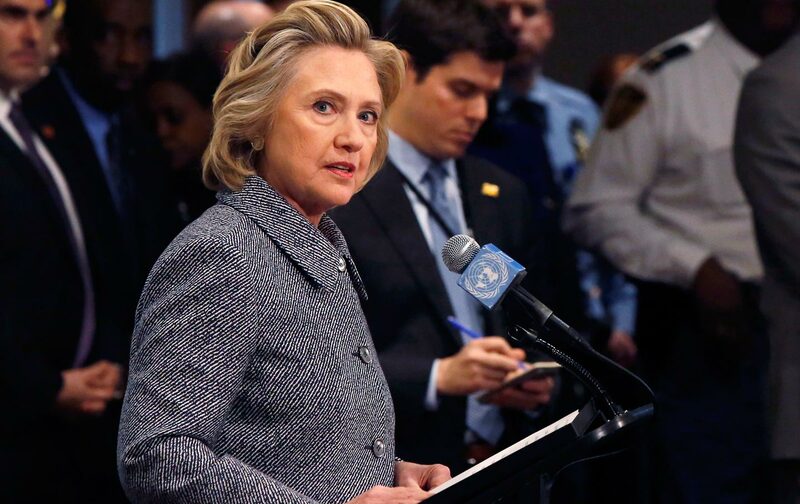 It is Clinton’s sense that she is above the law that is most galling. The State Dept IG stated that had she requested permission for the private server, permission would have been denied. That is elite privilege. And we still don’t know what the FBI is investigating (or not) regarding the Clinton Foundation. That’s a joke if there ever was one. Really. The emails are totally irrelevant, and have nothing to do with why I’m voting Green this time. I know already which way my state is going to go (same as always), so I might as well vote for a candidate who actually believes in the same things as me. 2.) Her campaign has been heavily funded by behemoth multinational corporations and Wall Street banks. 3.) She and husband Bill Clinton employed racist tactics in their attempts to bring down Obama in 2008. 4.) She lied about landing under sniper fire in Bosnia. 6.) She voted for the authorization of the use of military force in Iraq in 2002. 8.) She enthusiastically supported NAFTA and will likely pivot back to supporting the TPP. 9.) She earned $225K per speech to corporate behemoths, including Wall Street banks like Goldman Sachs, between her time as Secretary of State and before she formally announced her presidential candidacy. 10.) She is against Medicare-for-All, not because it’s unachievable, but because she and the Democratic party in general are beholden to the private health insurance industry, where profits come before people. There, that took only 5 minutes to compile. There are more reasons, so very many more, and Clinton’s use of a private email server while S.O.S. is definitely among them. The author here is easy on Clinton, like every other writer at “The Nation.” They are obviously terrified of Trump as are most of us, so they exploit and hide behind Trump fear and don’t call Hillary out on her record. Trump most certainly will. Just wait until after she’s been confirmed as the – worst ever – Democratic nominee. Too bad the FOIA doesn’t apply to the transcripts of Hillary’s Wall St. speeches. For months now on the Wall St. channel, traders, CEO’s, commentators have been saying they don’t believe the progressive things she said during the primaries, have every confidence she’ll “govern from the center” and “do the right thing.” Some are very concerned about Trump’s trade positions.